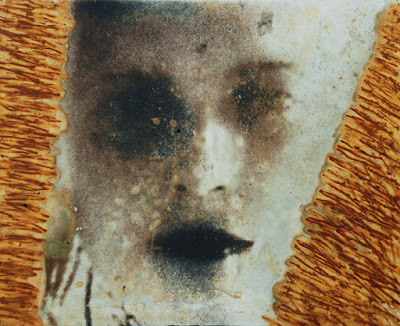 Scar is an exhibition of corroded photographs from Jim Haynes, who has investigated the technique of augmenting silver gelatin prints with rust, copper, and various acidic patinas. The intersections of the photograph and chemical stain are the provisional building-blocks for meaning and metaphor: blight, dislocation, subcutaneousness, toxicity, brackishness, psychic unease. Here in Scar, the human form is the underlying source material to these photographic objects, complicating the psychological allusions to the work. Prices and availability can be seen at helen AT helenscarsdale DOT com.